As a teacher, I’ve always felt pressure to keep my personal political views out of my classroom. In fact, in New York City’s public schools the Chancellor’s Regulations which lay out a wide range of rules, regulations and policies, explicitly forbids teachers from mixing any sort of political activity with their teaching. But lately, it’s become harder to reconcile this position with the real world political climate my students live in. The fact is, Donald Trump is not an ordinary politician. His rhetoric goes beyond typical political mud-slinging. It is dangerous, offensive, and demands a response from educators. About a month ago, I was eating lunch with a group of students when they started asking about the upcoming New York primary. In the unique, mostly-but not 100%-correct way of third graders discussing current events, they shared their opinions on the different candidates. When the conversation turned to Trump, the tone changed noticeably. Many of my students have parents who immigrated from Mexico while a few were born there themselves. I explained that we will still be able to send and receive mail to and from Mexico, but I wanted to explain so much more. Beneath their questions and comments, there was a mixture of anxiety and anger in their voices. Soon after that a grad school colleague of mine shared a story of her white students playing a variation of “cops and robbers. They called their game “Trump versus Mexicans”. None of these students have to worry about Trump’s wall personally. But they’ve caught on to his rhetoric just the same and internalized it in their own way. Different kids are making sense of this election in different ways. It depends on their age and their social location. But regardless, I believe that all three of these anecdotes illustrate the disquieting impact Donald Trump is having on our youngest Americans. There is no place for Donald Trump’s hate speech in our schools. If a student made similar remarks they would be referred to the dean or guidance counselor. If a teacher spoke in this way they’d be placed on leave. There is no way for us to ignore this language, as it has clearly seeped its way into our classrooms. Therefore we are obligated to name Trump’s words for what they are: racism, Islamophobia, misogyny, xenophobia and much more. As teachers we are expected to be “apolitical”. I would argue this has always been an illusion and that many teachers understand that by deciding how to frame various narratives in our classrooms, our work is inherently political. Regardless Trump’s words transcend “conservative” versus “liberal” dichotomies. So teachers must not silence ourselves when we hear children discussing him. I know plenty of adults (admittedly almost all Democrats) who are genuinely fearful of a Trump presidency. It makes sense for his words to scare children as well. 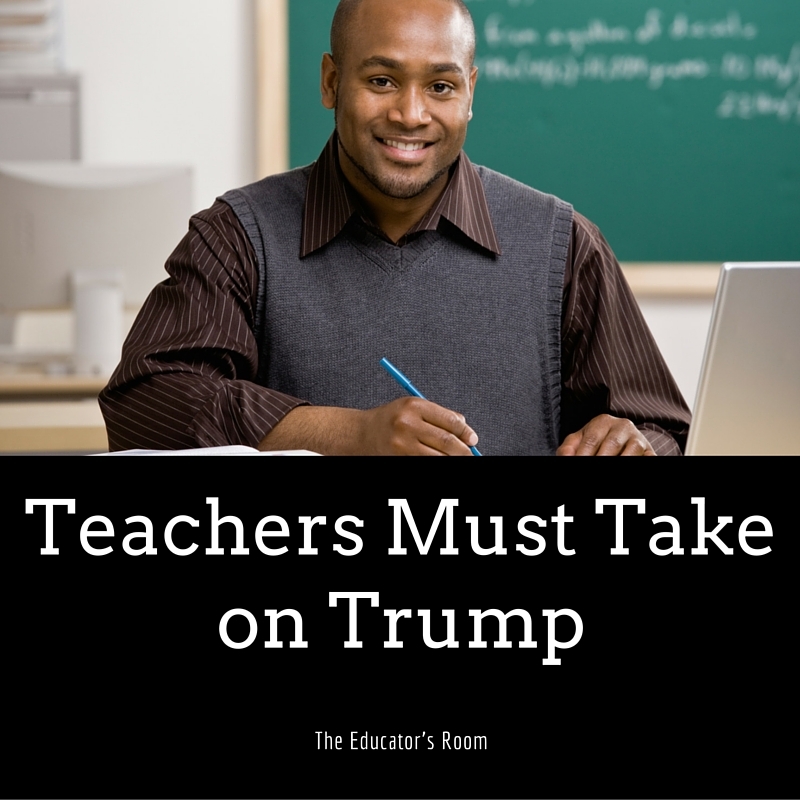 Just as we do with other complicated and scary current events, teachers must respond to Trump in our classrooms. We can start by creating space for students to share their opinions and feelings. Then we can sort out the facts from the myths, and we can brainstorm ways for students to take action. Through it all we should also clearly speak out against Trump’s hate speech. My school has several anti-bullying posters. In February, the whole school signed a pledge to stop bullying. In my classroom we also have an agreement, “Listen, speak and act respectfully.” I know that these kinds of agreements and pledges are common to classrooms and schools across our country. If Trump can’t follow these basic rules, then we as teachers must make it clear that his ideas have no place in our schools. Great article Ruben! So many children are afraid of what they hear from politicians. This year is much worse than most others. I see. Hate Speech = Opinions you don’t agree with. Plus, I have no doubt that you are purposely mischaracterizing what Mr. Trump is saying when discussing issues with your students. You are not teaching, you are indoctrinating. That’s not your job. Offended? Too bad…..run off and hide in your safe space, buttercup. So quick to judge Joseph. There’s no need for Ruben to mischaracterize Trump. He’s literally like the comments section of any site. Full of claims with NO evidence to back it up. Now hide in your safe space, buttercup. Reuben, Thank you for reminding me again why I homeschooled. It is self-righteous, conservative-hating, arrogant teachers like you who drive educated families like ours out of the public school system. An entire generation of students brainwashed by teachers like you. Tragic. I assume you go on the internet clad in your underwear with your conspiracy theories all while Fox News is blasting in the background. I’m glad you home school, because I’m sure you’re a parent that no teacher would ever want to deal with. Also the comment, “teachers like you” proves you’re not educated, but instead you’re a bandwagon, self-hating arrogant keyboard thug. Tragic. Wow a teacher who openly admits they want to brainwash our kids. This guy should be fired. Reading comprehension is not your strong suite is it? Why does the teacher not also inform his students that there is no Santa Claus, Easter Bunny, or Tooth Fairy! Or if he was an atheist that there is no God, Buddha, or Allah! The issue is that it is not his place to teach these things to other peoples kids. It is his personal opinion. The teacher in the next room might not have the same opinions as him. And I am certain that all of the parents of his students are not of the same opinion. This is a job to teach the given curriculum. Not to push his personal opinions on to young impressionable children. He he feels this strongly to talk about these things, do it off the clock. Go on the street corner and shout it to the world. Create a blog or a podcast show to talk about it. But it is not his job, or his place to teach these things to children that aren’t his own. Just like the example of telling them there is no Santa Claus or even a God. I know people are passionate about their convictions. But there is a time an place for everything. And this is deffinetly not the place. As teachers, it is our job to facilitate healthy discussions and not impose our political views. In the south the discussions would be quite different than those in New York. We should value and respect others viewpoints and teach respect for the political office of the president…not indoctrinate our students with our personal views!